The Double Down has been a great product........so we decided to offer a package of the products that help support the double down......with a cost saving too. 1. Double Down - Adds matched air flow, eliminates negative pressure build up and adds nice performance gains. Works excellent with motor builds too. 4. "Foam Buddy" pre filter - Adds true pre filtration for main air filter, helping aftermarket gauze filter with fine particles and adds extended service life and water repellency to the stock paper air filter.drivablity! Since you completely retain the stock intake system, we provide caps to block off the system so that you can utilize the snorkel kits that run off the stock intake. 5. 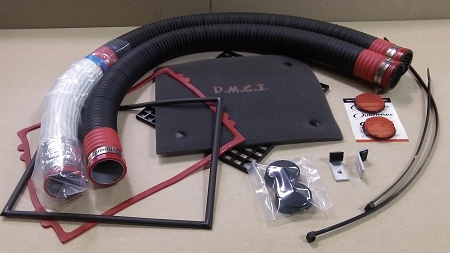 Outerwears - Additional prefiltration for our Double Down intake ducts. Available in red or black.